Masterfully designed by Tom Kite, Roy Bechtol and Randy Russell, The Legends Golf Course is an enjoyable challenge for golfers of all abilities. Less than 60 miles from Downtown Austin, the Golf Course is part of a lake-side community located on Lake LBJ in Kingsland, Texas. Legends is a par 72 championship course featuring Tif Sport Bermuda grass on the tees and Tif Eagle Bermuda on the fairways and greens. The architects transformed 200 acres of farm land into a masterpiece of open links on the front nine with a smooth transitions into the beautiful Texas Hill Country on the back 9. 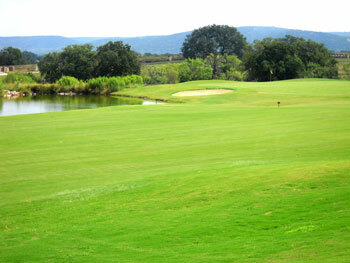 Lake LBJ surrounds the property and can be seen from many holes with the 8th hole resting along side the lake. Legends Golf Course is a spectacular place for any golf outing, either with your regular foursome, family outing, or event. Come and joins us. We want your golf experience to be the best. Our amenities include a full practice area, fully stocked pro shop, beverage shack and snack bar. For more information regarding tee times, membership, daily fee or tournament play, please contact the course at 325-388-8888.